A blast of the whistle and the hiss of steam and you’re away! 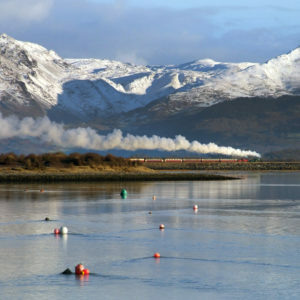 Sit back and relax on a nostalgic journey through some spectacular scenery. See the countryside change as you travel through; wide open fields, meadows, woodland and rugged mountain scenery. Journey in open carriages in the summer or the comfort of first-class observation Saloons. The train twists and turns as the carriages cling to the hillside. The railway is charming, a masterpiece of engineering opened in 1902 to carry lead ore, timber and passenger traffic. The narrow-track gauge allows the railway to follow the contours of the terrain with many sharp curves and steep gradients. The 11.75 mile journey takes approximately one hour in each direction. 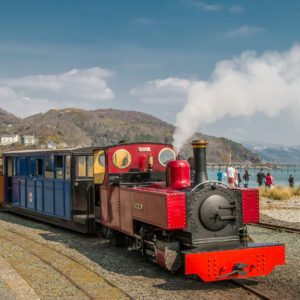 Listen to the sound of a powerful narrow-gauge steam locomotive working to climb up 700ft (200m) from Aberystwyth to Devil's Bridge. Trains normally wait for one hour at Devil's Bridge station before returning to Aberystwyth. Alight at one of the recently restored intermediate stations and explore the many walks the valley has to offer. If you would like more time than an hour to explore, you may return by a later train. Please discuss this with the Guard. The vintage steam engines and carriages were built for the line by the Great Western Railway in the 1920s and 30s. Now restored, they are still operating on the trains today. Aberystwyth is served by regular train services from Birmingham operated by Transport for Wales. Aberystwyth is served by Traws Cymru T1, T1C, T2 and T5 busses. Arriva and Lloyd's Coaches also operate local bus services. 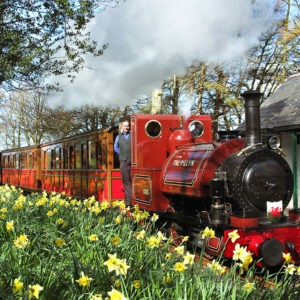 The Vale of Rheidol Railway is on Park Avenue/Boulevard St Brieuc, close to the centre of Aberystwyth. Follow the brown train signs to our free car park on Park Avenue/Boulevard St Brieuc (between the Park and Ride site and the Co-operative Supermarket). There is additional parking in nearby Pay & Display Car Parks. Please avoid parking at the mainline railway and local shopping centre car parks as charges may apply. Aberystwyth: there is a free car park on Park Avenue/Boulevard St Brieuc (between the Park and Ride site and the Co-operative Supermarket). If this is full, additional parking is available in nearby Pay & Display Car Parks. Please avoid parking at the main line railway and local shopping centre car parks as charges may apply. Devil's Bridge: there is parking next to the station platform.